Five years ago, the DJI Phantom 2 Vision would have seemed like a science fiction film prop or a piece of surveillance hardware flown only by the sexiest of superspies. But it is the first camera-carrying drone you may want to own — and you could do that without spending thousands of dollars. This drone is an intelligent, remote-controlled air vehicle that can fly far out of direct line of sight of its operator. It can record great video and photo stills from a thousand feet in the air over whatever “target” you can imagine. If it loses the connection to its remote control, it can even use GPS to fly automatically back to its launching point and land by itself. It is just like what you see on the news, only smaller, with about 20 to 25 minutes of flying time and less aggressive missions. I’m not exaggerating here: From the moment I opened the (huge) box containing this four-bladed flying machine and its remote control, I felt a degree of wariness that I imagine you’d feel if a bit of a stealth bomber fell off and landed in your backyard. But once that wariness wore off, and I’d gotten over the complexity of the hardware, the one word to sum up the Phantom 2 Vision is fun. Oh, my goodness, this thing is fun. The Vision is the latest quadrocopter from DJI, which has been in the business for a relatively short while. It’s not a toy by any means — and at $1,200, it is certainly not cheap. But it’s a world away from those tiny $20 remote-control helicopters that probably filled many a stocking this Christmas. The Vision is serious hardware. 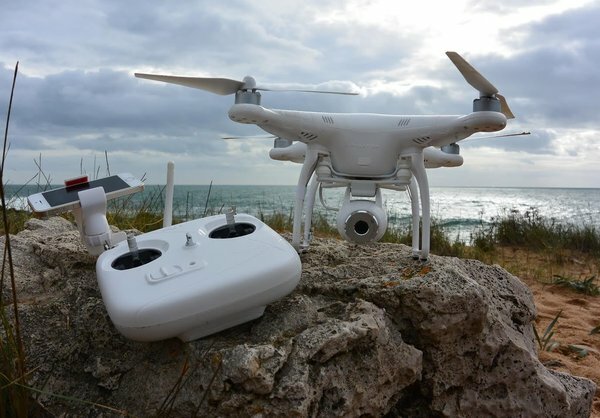 DJI has learned from the experience of its earlier Phantom drone, which is similar in appearance and still on sale at a reduced price of around $500. The older machine could carry a camera, like a GoPro, but you had to supply your own and mating it to the drone was expensive and tricky, often resulting in wobbly video. The Vision has better systems, including an improved battery unit that can be extracted from the drone to be charged, plus better flight software. Its best feature, though, is the dedicated high-res camera slung under its belly, mounted on a special vibration-reducing platform. Live video from the camera is streamed over a Wi-Fi link to your iOS or Android smartphone running DJI’s app. The app has controls for tilting the camera, activating a video capture or snapping a still photo. By tilting the camera, you can aim it more easily in flight to capture images at different angles. And while flying the drone using the traditional remote controller, you can watch the video feed on the app to take the drone beyond where you can see it. Testing the Vision in a forest clearing, I could fly it up through the opening in the trees, then when it was high above the leaves I could fly it farther just by looking at the display on the phone. It’s incredible. With the Vision, you can accurately film things that you would otherwise find hard to see properly with your own eyes — like a historic building from the right angle, or surfers from a vantage point close to the waves. It is easy to imagine how the Vision could be useful for sports photographers, architectural photographers and even event photographers — because you know drone videos are going to be the next wedding special effect. But is the built-in camera up to the job? Absolutely. Like the GoPro units it’s meant to replace, the unit has a wide-angle view and can record video onto an onboard micro-SD card in full HD at up to 1080i resolution and 60 frames a second. The vibration-reducing mount really does seem to do the job, too, resulting in smooth images. This is particularly true if the drone isn’t maneuvering when you hit Record. The camera doesn’t record audio, but most external sounds would be drowned out by the loud whizzing of the nearby props and their electric motors. Still images are captured at 14-megapixel resolution, which matches some high-end D.S.L.R. cameras, and the unit seems to do a good job of coping with a variety of lighting conditions. If the lighting is difficult, perhaps from bright sunlight, you can control some features, like white balance or shutter speed, from the app. The imaging unit is not without flaws, and it’s not as powerful as a professional hand-held S.L.R. camera. For example, there’s a noticeable fish-eye distortion in the image that comes from the unit’s really wide vision angle, and you can’t zoom the field of view. 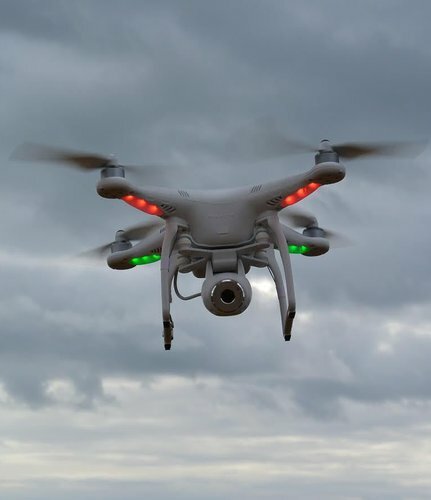 Even though the Vision is a large, complicated device, flying it is far easier than flying a traditional remote control helicopter or a large R.C. aircraft, thanks in part to its intelligence. If you let go of the controls, for instance, the Vision will use its GPS system to stop where it is in midair, keeping itself more or less stationary both horizontally and vertically, even in blustery wind conditions. Still, all is not smooth sailing. First, it comes with a 50-plus page manual, which you must read, because what you’re flying is in effect a very light aircraft. The last thing you want to do is to crash it, damaging your machine or potentially even hurting someone with its 14-inch-wide, three-pound mass and whirling blades. And despite its automatic systems, you are going to have quite a learning curve to safely and confidently fly the Vision — particularly if you’re going to take it beyond where you can see it directly. Another thing to consider is that regulations governing drones — whether for commercial use or by hobbyists — differ among countries and localities and are changing quickly. So it is best to check the local rules before you fly. As with real aircraft, dangerous moments happen near the ground. Manually landing the drone is hard, and takes practice. You’re going to bump it into the ground a few times. Luckily the body is sturdy, and it probably won’t get damaged. The one time I did this, all that happened was that it got muddy as the blades dug into the soft forest floor. Using the remote control’s traditional twin joysticks while tapping on the dedicated smartphone app to control the camera is tricky. You almost have to have three hands. You can, however, rely on the Vision’s autopilot to handle the flying for a moment or two so you can set up a photograph properly. It’s also tough to keep on top of charging all the batteries needed. The remote takes standard AAs, but the drone has a huge lithium battery that charges with a special wall unit. There’s also a “Wi-Fi range extender” bolted to the top of the remote control to connect your smartphone to the Vision’s camera; this is charged over a micro-USB cable and another wall charger. And you have to remember to keep your smartphone charged to actually fly the drone. Once you’ve gotten past all this, you are in for pure excitement, plus great video and stills. For professional photographers or videographers looking for an unusual shot in decent digital resolution, it may well be worth the price tag. For the rest of us, it’s a way to have a bit of tomorrow’s tech in your hands today.